Home >> Blog & Stories >> Blog >> Opinion: Investment in Food Security Is an Investment in Global Stability. Here’s Why. Opinion: Investment in Food Security Is an Investment in Global Stability. Here’s Why. Domestic food crises don’t stay that way for long. For proof of this, look to Colombia. 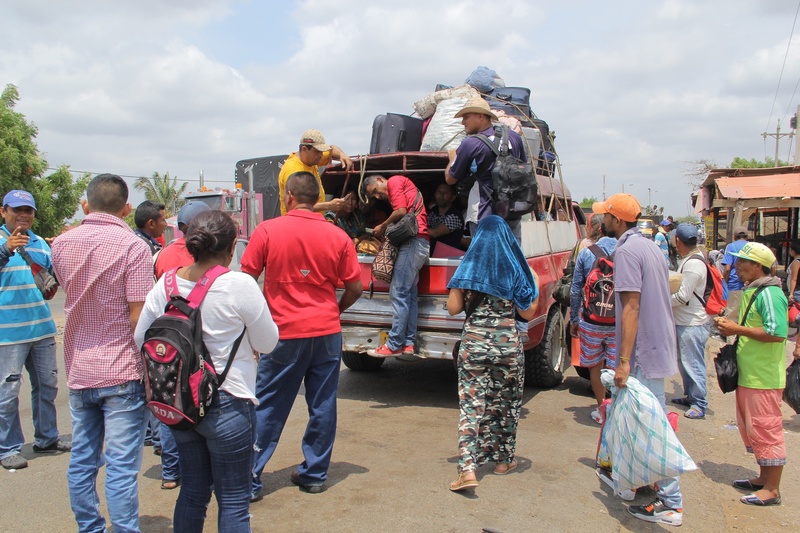 In recent months, it has received over a million migrants from neighboring Venezuela, a country experiencing violent upheaval resulting — in large part — from a food crisis years in the making. In a globalized world where instability does not respect borders, nontraditional security threats such as food insecurity are poised to play a more central role in global crises. Globally, hunger is on the rise for the first time in over a decade. Right now, 815 million people worldwide — 1 in 9 — will go to bed hungry tonight. Venezuela is one of the most recent nation where food insecurity is threatening economic and political stability, but it is not the only example. Exactly a decade ago, food price spikes in no less than 40 developing and middle-income countries led to such widespread social unrest that observers dubbed the phenomenon the “silent tsunami.” This dramatic rise in food prices and the resulting unrest are now widely recognized as ultimately leading to the collapse of the Haitian government. A second wave of price spikes owing to agricultural commodity production shocks in China and Russia in 2011 has also been linked to the rise of the Arab Spring in the Middle East, demonstrating the troubling reality that, in a globalized economy, crop loss in one part of the world can produce political instability in another. That same year, in the lead up to the Syrian civil war, the country experienced the culmination of what one author referred to as “the worst long-term drought and most severe set of crop failures since agricultural civilizations began in the Fertile Crescent many millennia ago.” This unprecedented multiyear drought destroyed the livelihoods of more than 1 million Syrian farmers, forcing many into the southwestern city of Daraa, which became one of the first sites of social unrest in the country. Still, Venezuela’s story is, in part, unique. They country’s descent from the wealthiest nation in Latin America to one of the worst humanitarian disasters on the continent would be a storyline typically reserved for a country at war, or one rebuilding from a cataclysmic natural disaster. Yet Venezuela has experienced no recent “act of God,” nor is it engaged in a traditional war. Its citizens, however, fight a battle to feed themselves every day. Soldiers stand guard in front of supermarkets to quell riots. Citizens begin lining up in the middle of the night for the opportunity to purchase anything that might be available on market shelves come morning. The average Venezuelan has lost over 20 pounds over the past two years. Today’s Venezuelan food crisis has deep roots. The country is an oil-rich nation with the single largest proven oil reserve in the world. Yet in the face of falling oil prices and years of poor management of its domestic food supply, Venezuela can neither meet food demands domestically nor access sufficient food on international markets. Access to food is further limited by hyperinflation and an insufficient currency supply. Long, snaking lines in front of empty ATMs are common across Venezuela’s cities. Inflation has topped 46,000 percent annually, and a basic basket of supermarket food costs, on average, four times the monthly minimum wage. Access to nutrient-rich food has been especially reduced, with cheap starches such as yucca and potato taking up larger proportions of many families’ diets. Unchecked food insecurity and growing poverty have produced an inevitable outcome in the country: Deteriorating security. Venezuela has become one the world’s most dangerous places, hosting 2 of the 10 deadliest cities in the world. The country has reached a tipping point in recent months, with a surge of families fleeing the country unable to feed or protect their families. There have even been reports of soldiers defecting to sell their weapons for food. The resulting migrant count has surpassed 1.5 million people, with most destined for Colombia. Humanitarian organizations including the World Food Programme plan to reach 350,000 Venezuelan migrants with lifesaving food assistance in Colombia, a country itself emerging from a 50-year civil war and in the midst of a fragile peace process. To be sure, the origins of Venezuela’s crisis are multicausal and food insecurity is very likely an early symptom of deeper socioeconomic troubles. Food insecurity, though, is often the “straw that breaks the camel’s back” in fragile countries like this. Hunger produces desperation that causes communities to act on existing grievances, cleaving society along pre-established lines. Global instability is on the rise for the first time since the immediate aftermath of the Cold War, and food insecurity is featuring centrally in many of these modern-day crises. This trend will surely force military and intelligence communities to broaden their definitions of “security” — and serve to emphasize that one of the best investments we can make in global stability is to help people who can’t feed themselves or their families. The United States has long led in the fight against global hunger, regardless of party affiliation or political ideology. This Congress has upheld this legacy. They should be commended for these efforts, as these investments not only represent the strong moral foundations on which this country was built but are also smart investments in global stability and our nation’s security. *Rick Leach is the president and CEO of WFP USA. *Chase Sova is WFP USA’s senior director of public policy.